The Comox Valley Chapter of the Council of Canadians welcomes agrologist and author Wendy Holm to Courtenay on Wednesday, July 11, to discuss her latest and critically acclaimed book, Damming the Peace – The Hidden Costs of the Site C Dam. In December 2017, the provincial government, in a decision that shocked many British Columbians, announced they would continue with the construction of Site C. This decision was reached despite the looming, unanswered questions regarding the estimated costs and the dubious long-term, economic viability of the project. We need the power, of that there’s no mistake – unless you ignore the urgency of the climate crisis. We can find power elsewhere and we can do it without sacrificing nature and wildlife, without sacrificing farmland and without sacrificing the territorial right and cultural wealth of First Nations, writes author Holm. 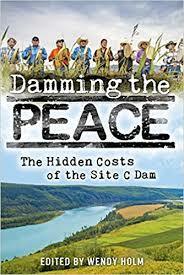 Damming the Peace – The Hidden Costs of the Site C Dam, includes Holm’s own critical observations and presents the independent voices of citizen experts who, after extensive research, describe the far-reaching impacts of the dam. The book exposes potential links to the project that range from Site C’s role in Canada’s climate change strategy, natural gas extraction, and fracking, to continental water sharing and the role large projects play in the corruption of governments. The on-going opposition by landowners, legal challenges by First Nations, cost over-runs and unstable geological conditions all indicate that the future of BC’s most expensive infrastructure project is, and should be, in question. Site C is an economic white elephant … we do not need the Site C dam. It is time to close the project down, writes Holm in Damming the Peace. To continue will have devastating, irreversible consequences for all of us. Holm’s book tour to the Comox Valley, sponsored by the CV Council of Canadians will take place Wed., July 11, at 7:00 pm in the Rotary Hall, Filberg Centre, 411 Anderton Ave, Courtenay. Holm is donating proceeds from the sale of Damming the Peace to the Nun Wa Dee Stewardship Society to support the legal costs of the Prophet River and West Moberly First Nations. She will be available to sign copies of her book before and after the event. Doors open 6:30 pm. Wendy Holm is a professional agrologist (retired), an award-winning national columnist, a double Queen’s medalist, a distinguished UBC alumna, past president of the B.C. Institute of Agrologists and B.C. Agrologist of the Year in 2000. She provided expert testimony before the Joint Federal Provincial Panel on the agricultural impact of the Site C project. This entry was posted in Climate Change, CV Council of Canadians Chapter Newsletter, Events, News and Events, Water and tagged Comox Valley Council of Canadians, Damming the Peace, Prophet River and West Moberly First nations, Site C, Wendy Holm by riverside11. Bookmark the permalink.